Trading binary options would be perfect when you rely on both technical and fundamental analysis. You can decide whether to buy the Call or Put option only after closely analyzing the chart and watching the news as well. Speaking about the fundamental side of the analysis, one of the most essential economic reports is the GDP of a country. 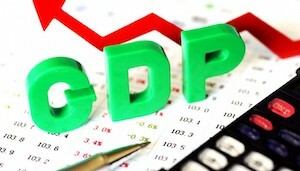 The GDP stands for the Gross Domestic Product and shows the combined value of goods and services of a country. When watching the GDP performance, one can conclude whether the economy is in a recessionary state or in a growing one. A growing economy is about an advancing GDP, which later would naturally result in increased interest rates by the central bank. When the GDP is slowing or even goes in the negative territory, the central bank is forced to support the economy by decreasing the interest rate. This is because whenever the interest rate increases, the money becomes more attractive for deposits, and when the rates are decreased, the currency demand drops and the money are easily pushed into the economy. The interest rate is one of the most important factors that influence the strength of a currency, so if you trade currency pairs, you would be interested to know what the central bank has to decide on this rate. During a fiscal quarter or a trading month, the latter being the period between two central bank meetings, the investors are debating and trying to predict what the central bank would decide at the very next meeting. To make it easier to assess the central bank’s future decision, the market participants closely watch the economic reports that may hint to future increases or decreases in the interest rates. As we discussed in the previous paragraph, the GDP stands in the first line as one of the most important economic reports and is published every month or quarter. Every country tries to estimate its GDP, so whenever your trade a currency, you should wait for the GDP release and try to predict the future interest rate based on its performance. We will help you to assess the economic growth of different countries by providing you with an economic calendar, which is so important for carrying out a decent fundamental analysis. Based on the GDP growth or slowing, you may understand whether to buy Call or Put options in the long-term. You should know that the GDP is available in more formats based on the country that reports it and this is an essential report that cannot be ignored. Keep in mind that the first release makes all the difference. For instance, in the UK, the first release is called the preliminary GDP and this is what you should be looking for. The markets react to this report instantly. There is the second one, the actual GDP report, but it rarely differs from the preliminary one, so it is not considered so much by the market participants. The same is true for the US – the Advanced GDP is not closely monitored in comparison with the preliminary GDP release. The GDP is the most important economic indicator that shows the combined value of goods and services of a country and is monitored by the central banks so that the latter could make a conclusion about the possible future rates. As we mentioned, when trading currency pairs, the interest rate is the main driver, while the GDP is the main indicator that helps us predict the rate. The GDP shows us if the economy goes well or is slowing. Let’s imagine this at a practical level. Let’s say that the GDP is showing a negative value in relation to the previous report, so the economy is slowing or is in a state of recession. To fix this major problem, the central bank will most likely decrease the interest rate, which will support the economy. The negative GDP shows that the consumers don’t have the possibility to spend, which does not support the sales. Consequently, when the sales drop, it means that the demand for goods decreases and the factories and producers are forced to cut labor force, reduce their spending and record losses rather than profits. This vicious trap is the last thing a central bank would like to see in the economy it controls. This is why at each meeting, the central bank members decide on a monetary policy that could support the economy by any means, and the best method to do it is to cut the rates and let the money flow into the economy without many obstacles. By dropping the interest rates, the money doesn’t become such attractive for deposits, and they are invested in businesses and spent much easier. Now, you can see how important is to assess the GDP that shows the state of an economy and can provide further hints about the possible interest rate and currency demand for the future. We hope that you will keep an eye on the economic calendar and will surely analyze the GDP of major economies like the US, the UK, the EU, and other countries. Note that the GDP change itself does not tell a lot – you should focus on the difference between the market expectation and the preliminary GDP. If you learn how to interpret these reports, you may become a successful binary trader.